Last Sunday morning was my only chance to get out. Rain was predicted but luckily did not start until I left the Chicago Portage. Conditions became ever cloudier which affected everything photographic, but now I am looking back on what was then warmer weather with increasing nostalgia. I had stepped off the trail to get a better look at something and while I was standing there, a beautiful Black-Throated Green Warbler popped up in front of me. In that moment I was thankful I didn’t have my most humongous lens which might have scared him off. Below is how the Portage looked last Sunday morning. After the Black-Throated Green left, this Swamp Sparrow occupied the same spot for a moment. The Black-Throated Green was unusually late for this location, so he earned a citation on the rare bird alert. 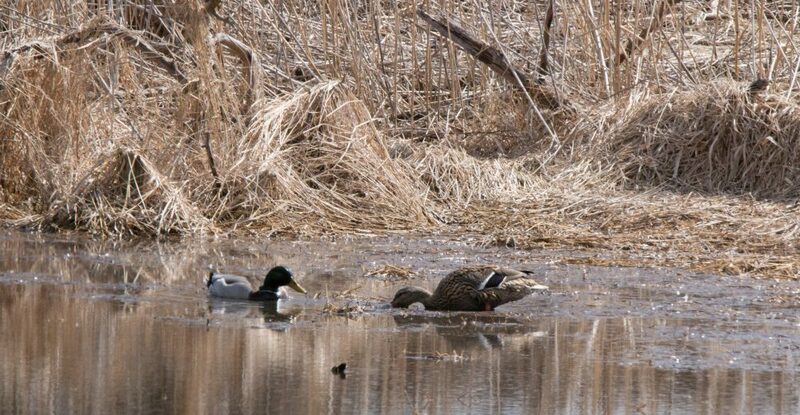 But the rest of the birds were pretty predictable, like these three Mallards enjoying the open water. A Red-Tailed Hawk made a couple backlit appearances… If you click on the images you can see more detail. I followed the large white rump patch of this Northern Flicker in flight until it landed far across the pond. Below, two birds that herald various stages of the approach toward winter…a Dark-Eyed Junco, a snow bird, and likely the last Yellow-Rumped Warbler until spring. The other likely late-ish warbler is the Palm Warbler below. And where the preserves were crowded with kinglets the previous week, I now saw only one, a Ruby-Crowned Kinglet, below. On the home front, after a short sprinkle but before ensuing downpours, my yard was full of House Sparrows. But I did still have a couple White-Crowned Sparrows who now rely on me to put out some partially chewed-up spray millet sprigs in the compost. Hanging out with the House Sparrows by the back fence was a Northern Cardinal. A few House Finches managed to forage on the ground. After weeks of preparation, I jointed the Unity Temple choir in our “Best of Unity Temple Choir” concert last night. We sang for nearly two hours. I feel we did well, at least if the audience response is any indicator. It was exhausting fun. It’s still hard to believe that the milestone has passed, however. Without much time to reflect, I am moving onward to the next challenge, which will be at work tomorrow morning. I leave you with a contented-looking House Sparrow. This entry was posted in birding, birds, ducks, fall migration, House Finch, photography, Sparrows, Warblers and tagged Black-Throated Green Warbler, Chicago Portage, Dark-Eyed Junco, House Finch, House Sparrow, Mallards, Northern Cardinal, Northern Flicker, Palm Warbler, Red-Tailed Hawk, Ruby-Crowned Kinglet, Swamp Sparrow, White-Crowned Sparrow, Yellow-Rumped Warbler by Lisa Rest. Bookmark the permalink. beautiful….. so many birds out there……. these are lovely creatures……. Thanks. I am starting to appreciate the ones I take for granted more as the migrants disappear. I don’t know what’s worse, having a beautiful place for birds, not many species but plenty of opportunities to watch them or being in an area where more birds visit and not having much time to find them… it’s going to be a long winter. Don’t worry about it Lisa. Let the birds look for you. We are colder than normal too. It’s frustrating. And too dark in the morning. Sorry you went to Alabama and the birds weren’t there. What’s an avian to do? I am pleased that your concert went well. Oh my thanks so much. The music is still flooding my head. I am most glad the audience enjoyed it. Hawks are always exciting, neither Judy nor I have ever gotten a photo of one in flight. Northern Flickers are one of my favorite birds. How can one obtain millet sprigs? Or do you grow them yourself? Spray millet is foxtail millet, apparently, and although you could grow it, the birds might demolish it. It’s grown commercially for the pet trade and small quantities can be rather expensive. My indoor birds adore it so I buy it in 25-lb. quantities. I suspect it’s sort of addicting like popcorn for birds. I haven’t noticed the House Sparrows or any of my other yard regulars liking it but the White-Crowned Sparrows seem to appreciate it. My theory is they have seen it growing in Canada during their breeding season. Wonderful series, Lisa! I especially love the Black-Throated Green Warbler captures, I’ve never seen one before!